Heat oven to 375°F. Spray 2 regular-size muffin cups with cooking spray. Place rolls on cutting board; let stand 10 to 15 minutes to thaw. Make a horizontal slice in side of each roll, cutting almost all the way through and making a pocket, but leaving attached 3/4 of the way around. Spoon 2 teaspoons pizza sauce into pocket in each roll. 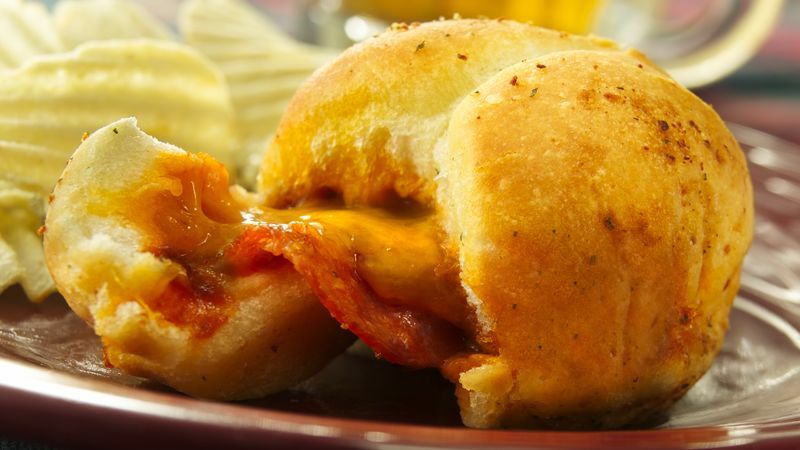 Place 3 slices pepperoni over sauce in each roll; carefully spoon 1 tablespoon cheese into each. Place in muffin cups; press gently to close. Bake 9 to 11 minutes or until cheese is melted and bubbly. Remove from muffin cups; serve warm. Make as many or as few snacks as you like. Just take the number of dinner rolls that you need from the resealable bag and pop the rest back into the freezer.